Chandigarh, November 18: Clouds of uncertainty are hovering over the employment of nearly 50,000 contractual and ad hoc employees of the Haryana Government. 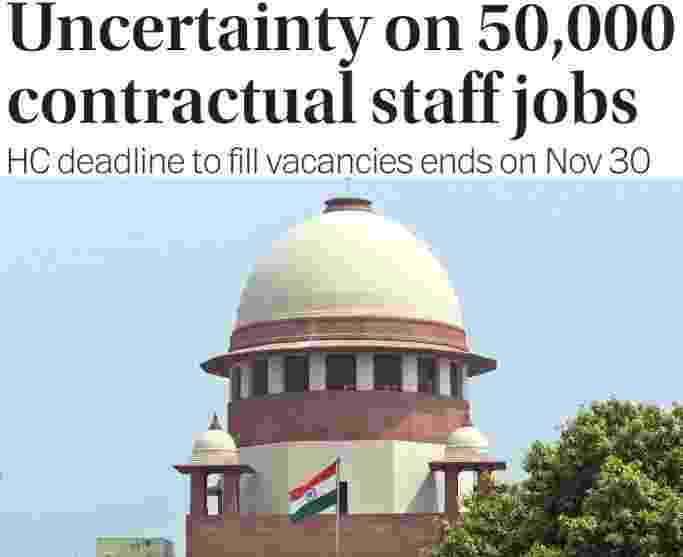 With the High Court’s six month deadline to fill vacancies on a regular basis in place of the contractual and ad hoc employees ending on November 30, the contractual staff is in a state of tizzy. In fact, it is double whammy for the contractual staff as the Supreme Court, which was moved by the Haryana Government to challenge the May 31, 2018, judgment of the high court quashing the regularisation policies and setting the six month deadline, is yet to hear the matter. “As there are thousands of employees who had been appointed on ad hoc/contract/work-charged/daily wages to take care of the work being carried out by them in different departments, we direct that they be allowed to continue for a period of six months, during which the state shall ensure that regular posts, wherever required, are advertised and the process of selection is completed,” the high court in its May 31 judgement had said. The high court had made it clear that under no circumstances would any temporary employee be allowed to continue thereafter. 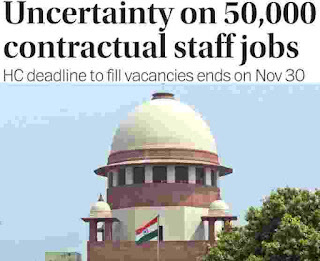 “Unless there is a relief from the Supreme Court, over 50,000 contractual employees face the spectre of losing their jobs,” Subhash Lamba, Sarv Karamchari Sangh (SKS) general secretary, said, demanding that the Khattar government should bring an ordinance for the regularisation of the services of the contractual staff. It may be recalled that the state government had prepared the draft Bill — Haryana Regularisation of Services Bill, 2018 — to be tabled in the Monsoon Session of the Haryana Assembly. However, taking a U-turn and with a view to exhausting the legal options before a Bill is brought before the Haryana Assembly against the May 31 HC order adversely affecting the contractual staff, the Haryana Government filed an SLP in the Supreme Court in September. The apex court is yet to be hear the SLP. Disclaimer: We took this information from The Tribune Newspaper published on 19th Nov. 2018 on the page Number: 06.